The pts we are using RO with have done a 180! They are so happy they have a treatment that is actually working for them. I have found it to be very user-friendly. The patients themselves have said that they have found it very impactful... For me, I have found that it’s been very helpful to me to provide the therapy but also for my own personal life. 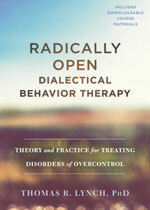 RO DBT focuses in on social functioning and getting better relationships. Very few other therapeutic techniques teach patients actual skills — how to use their own body to help to them interact differently with and influence their environment. People pick the skills up fairly quickly.